An attractive and difficult trek on the mighty Stol. From Kobarid you take the road to Italy. In Staro Selo you take a right turn for Breginj. You stay on this road until the village Sedlo where you take a right turn. This is followed by 12 kilometres of difficult trek which takes you past the relay station to the mountain pasture Božca. This is the most difficult part of the trip. 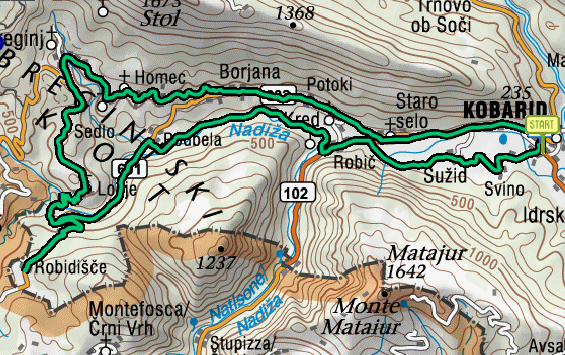 You take the route for bivouac Hlek at the crossroads (1370m) on Božca. You pass the wood and take a bad gravel road which runs just below the ridge. The path descends slowly. You pass a mountain spring and the bivouac to arrive at the hunting lodge (1225m) under the peak Na vrhu. You proceed to the area with cattle fences. You pass the gates and proceed on the track until you reach a meadow (1125m) where the road ends. The rest of this path is not well marked. You proceed to peak Starijski vrh (1147m). Here you go into the woods and the path starts to descent quickly. Next 100m of altitude should be done on foot. Later you start riding again (S5 and S6 difficulties) and descend to a small mountain pasture (905m) with a barn. You take a sharp left at the barn and ride down the meadow on an old unmarked dirt track. You follow the road (S5) until you reach a flat grassy clearance (895m). You take a right here and follow the dirt track. The track becomes better visible and rocky (S5 and S6). You pass several shepherds cottages to arrive on the mountain pasture pod Babo (780m). Here you take a left to a better track (S3 – S4) and descend down to the forest road Trnovo – Hlevišče (700m). 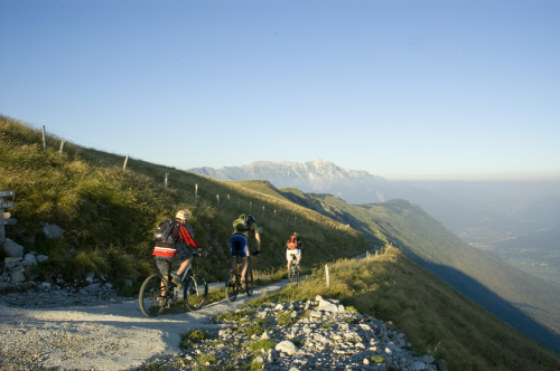 You take the forest road and it leads you to the main road Kobarid – Bovec (340m). You take a right turn for Kobarid. You can descend to village Potoki from bivouac Hlek. The path is marked. The first part of the path takes you over old unused meadows. About half way to Potoki you arrive on a forest road, which takes you to the village. This path is not too interesting for cycling. You travel to the hunting lodge and pass it. You travel towards Starijski vrh and take the old Italian military road. The road is not maintained regularly so rocks and fallen trees make the journey more difficult. The military road brings you to Staro Selo from where you take the main road to Kobarid. This path is not too interesting for cycling due to the bad road and a quick descent. On the mountain pasture pod Babo you travel to a weekend cottage, which lies at the end of the meadow. There is an old Italian military road which begins there and takes you directly to Kobarid town center. 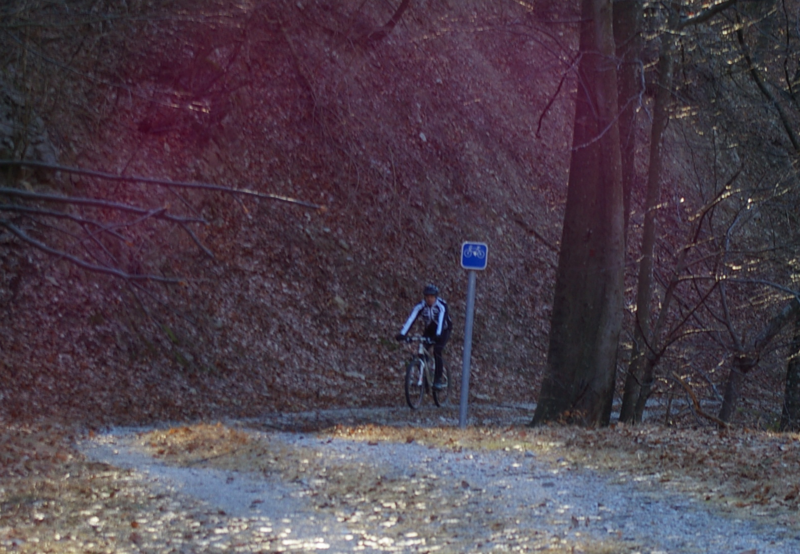 This path is a bit more difficult and interesting to cyclers. C) You can descend down on the same road you took to the top. The whole trip would be cca 35km if you take this path. The ascent to Mija, which dominates the Nadiža, is very interesting due to vistas and the fact that the road is mostly in tree shade. From Breginj you take the main road to Borjana. In Borjana you take a sharp right at the church in direction of Podbela. You arrive in Podbela and pass the village. You cross the bridge over Nadiža and follow the river to the Napoleons bridge. About 100m past the bridge you take a left on a gravel road. The next two kilometres are a slow ascent. When you ascent the second ridge you arrive to Zgornja Mija mountain pasture (800m). You proceed on a forest road until you reach a sharp left turn (820m). There is a track on the right which is a dead end. You continue on the track and reach the next crossroads (840m). A) You take a left at the crossroads and after a kilometre you reach the hunting lodge on mountain pasture Spodnja Mija, which is our final destination. B) You take the right fork. 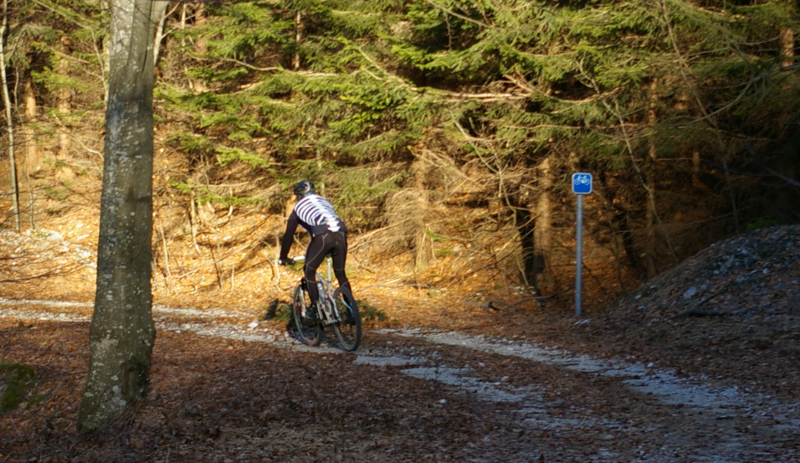 You ride a narrow and badly maintained forest road to a sharp right turn. There is a clearing with a hunting stance there. About 300m on you take a sharp right at a crossroads and follow the track until it ends. This is our final destination (960m). You can make the trip longer if you take a detour over the village Logje. A picturesque trip on tarmac road which takes you around the Breginjski kot. You take a right for Breginj in Staro selo. You ascend to Borjana (cca 5km) and take a left for Podbela. You pass Podbela, cross the Nadiža and continue to Robidišče. There are around 2 kilometres of mild climb from Podbela to Napoleons bridge and another 5 kilometres of a bit more difficult ascent to reach Robidišče. You drive through Robidišče and descend to the old border crossing. You continue on the road for a kilometre and then take a left fork towards Črni vrh (Montefosce). In 4 kilometre you arrive in village Kal (Calla). From there you descend past villages Zapatok (Zapatocco) and Erbezzo to Log (Loch – Linder) where you cross the Nadiža and reach the main road. You take a right and follow the road past the village of Štupca (Stupizza) to the old border pass Robič and then on to Staro Selo. 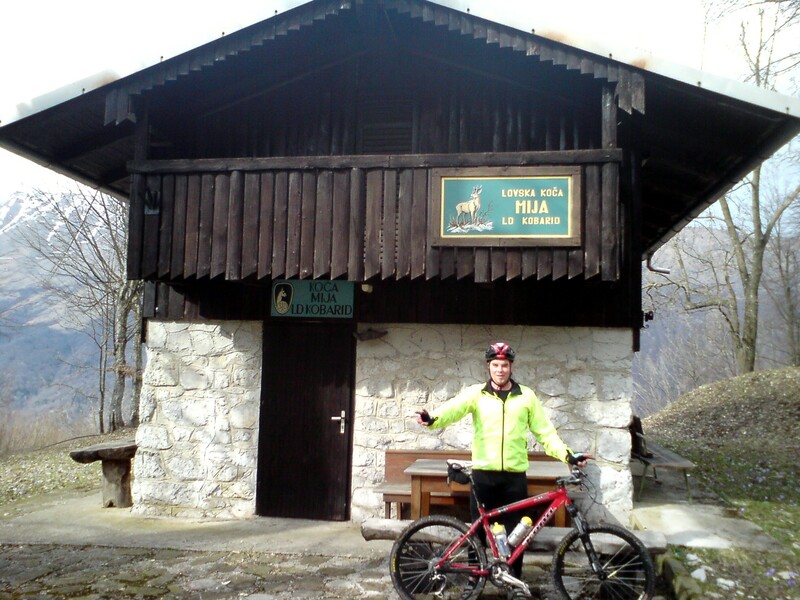 A very interesting bike trip in the western Breginjski kot and the neighbouring Italy. The trip includes tarmac, gravel and forest roads and is better for mountain bikes. From Breginj you take the road to Logje. In Logje you take a left road right before the church. The road quickly deteriorates from tarmac to gravel and takes you over the fields and abandoned meadows. The gravel road changes into a forest road and starts to descent quickly past Lup to Podbela. In Podbela you take a sharp right at the end of village sign and follow the road to Robidišče. You pass Robidišče and continue to the old border crossing. A couple of meters after it you take a right turn on a gravel path which leads to the valley of Legrada stream. Once you cross Legrada you ascend to village Prosnid (Prossenicco). There you take a right turn to a tarmac road and descend past the graveyard to the old border crossing Most na Nadiži (Ponte Vittorio). You cross the bridge and descend back to Breginj. This picturesque trip takes you through the woods of Ladina, past rocky Plazi and Gnjilce to the spring of Nadiža and on to small villages in Italy. From Breginj you take the road to the old border crossing Most na Nadiži. After approximately 3 kilometres you spot a roadsign which points you right to the spring of Nadiža. You take this bike road and follow the signs. After 6 kilometres you come to a crossroads and take the lower (left) fork. After a kilometre you come upon road sign for Brezje which you follow. You have about 3 kilometres of walking path ahead of you. The path passes the spring of Nadiža and crosses the state border. In Italy the path joins a gravel road. There are some parts of this road which will demand a shorter dismount from the bikes. After a kilometre the gravel road brings you to the village Brezje (Montemaggiore). From Brezje you take the tarmac road on the left fork for Bune (Bonis). After 2 kilometres you come to the main road from Plastišče(Platischis) to Tipana (Taipana). Here you take a left turn for village Plastišče. In the middle of the village you take a right turn out from the main road to an old road for Prosnid (Prossenicco). You have about 6 kilometres to the main road Prosnid – Most na Nadiži. You can take a right turn to visit the village of Prosnid which is about 500m from the crossroads. Turning left will take you to Most na Nadiži and from there back to Breginj. A circular trip in Breginjski kot. The trip follows the river Nadiža, which is a top swimming destination in the summer. This bicycle trip takes you on the old main path of Breginjski kot. You start our trip in Breginj. You go from the main road Breginj – Kobarid at the house nr. 3 and take the old path. The path first takes you over meadows and then turns into forest. You travel for about a kilometre when a gravel road cuts our path. You cross the gravel road and continue on the narrower part to the graveyard. At the end of the graveyard you take a left towards a small stream. The bike needs to be carried over the stream. You continue our journey on a well maintained path to the old village of Stanovišče. You pass the village and head straight for the meadows. Your path will become more visible at the edge of the forest. This path brings you after a kilometre to the main road. You turn left on the main road and proceed past the villages of Borjana and Potoki. When you reach a bus stop Kred you take a right turn and descend into the village. You take a right turn at the end of the village and drive on towards Nadiža. This is where you join the bike trail from Robič to Podbela. The next 5 kilometres camping are spent on this track. There you take a left onto the tarmac road for Robidišče. After 100 meters you spot a gravel path on the right side which leads to the church of St. Helen. You take this path and stay on it for about 2 kilometres, until you reach a crossroads. You take the left fork and after a kilometre arrive in Logje. In Logje you take a right on the main road and drive towards Breginj. 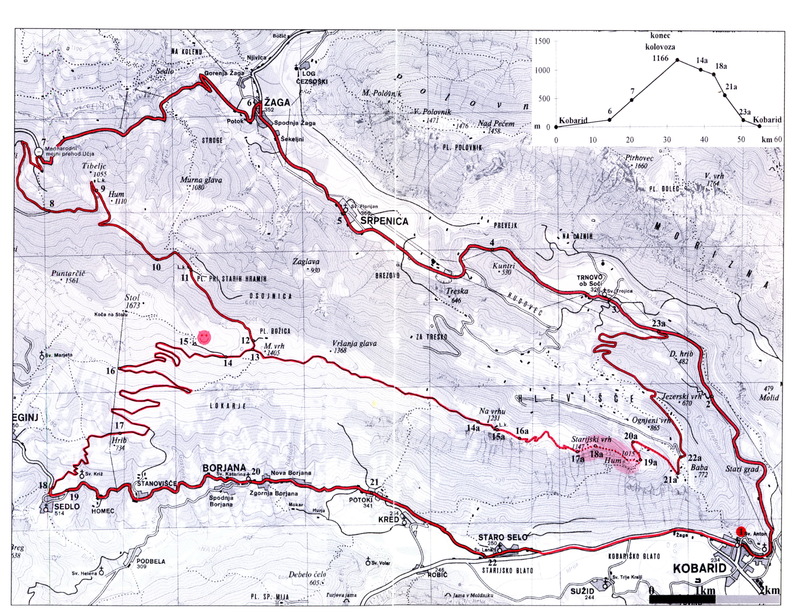 A circular trip around Breginjski kot. The trip follows the river Nadiža, which is a top swimming destination in the summer. From Kobarid you take the main road towards Italy. At Staro selo you take a right turn for Breginj. You take the main road to Breginj and once there turn for Logje. From Logje you descend to the Nadiža river. From the river you ascend to the village of Robidišče. From there you continue to Podbela. 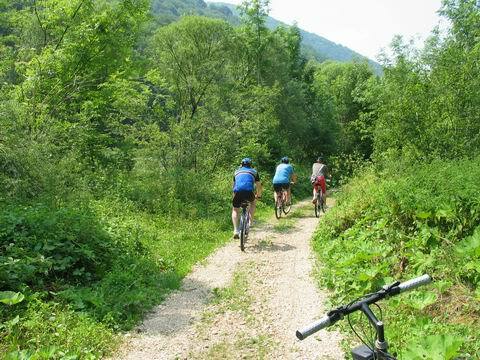 In Podbela you take the path to camping Nadiža and then follow the marked bike trail which brings you to Robič. From Robič you return on the main road to Kobarid.